To learn more about MBX-12 techniques, visit this page. Condensing posture is a diaphragm strengthening exercise. When you inhale, the diaphragm moves down (contraction) sucking air into the lungs. 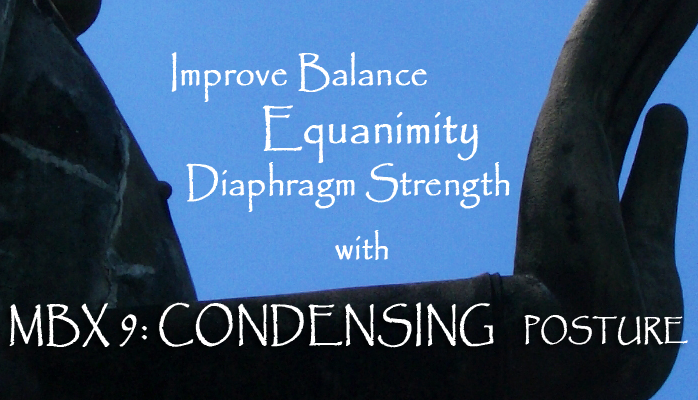 During exhalation, the diaphragm moves upward toward its original position (relaxation). When you inhale slowly and mindfully and hold your breath for a few seconds, you are holding the diaphragm in a maximally contracted condition, strengthening it. When you exhale slowly and mindfully, controlling every inch of the returning diaphragm, you also strengthen your diaphragm. Having a strong diaphragm helps you build your inner energy, which is centralized in the middle and lower parts of your torso. Be aware that your breathing controls and is controlled by the diaphragm. MBX 9: Condensing Posture increases a sense of physical control and composure. 1. From natural stance, place your heels outward and lower your posture. Inhaling slowly and deeply, raise your hands beside your shoulders with your palms sideways. Keep your elbows bent and fingertips upward. You are collecting the energy in the lower belly. 2-3. Exhaling, slowly push your palms out to the sides. Push the belly slowly in and release the diaphragm upward. You are pulling up the energy to the middle energy center. Hold this posture (3) for 2-3 seconds. 3-4. Exhaling further, lower your hands to the front of the belly (4), and press your palms together to release the remaining air from the lower belly. Inhaling, return to natural stance. When practicing lateral pushing posture (2), imagine that you are slowly pushing away a wall on each side of you. To do so, you pull the energy from the lower belly to the chest and then to your hands. Remember that your thought directs where your energy goes, affecting the quality of your performance. MBX 9 strengthens the diaphragm. With inhalation the diaphragm moves down (contraction). With exhalation the diaphragm returns to the original position (relaxation). Condensing posture increases tension toward the lower belly region. During condensing posture (3), exhaling, focus your attention on regulating the contraction of the lower abdomen muscles and relaxation of the rising diaphragm for steady exhalation. 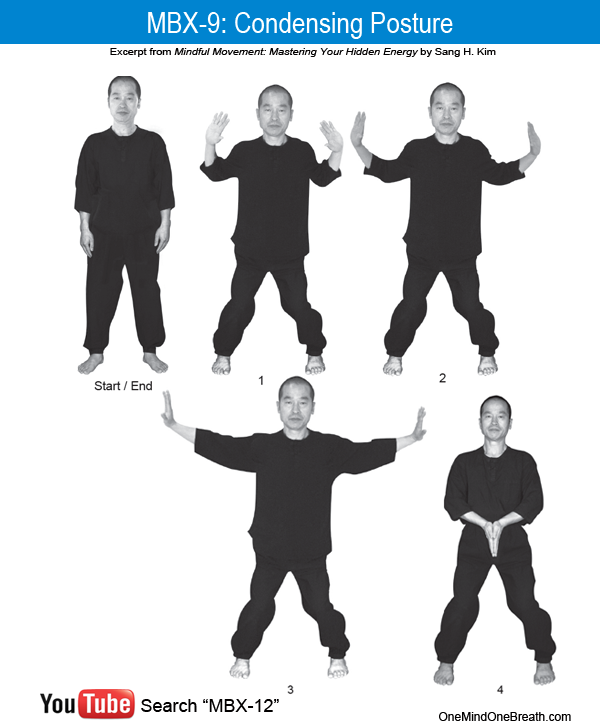 When you push outward (‘Resistance’ in the photo above), your inner energy in the lower belly is being pushed upward to the chest, and finally being released through the hands. The upward diaphragm movement facilitates the surging energy flow like a piston. During the compression posture (4), exhaling further, contract the belly muscles to push the diaphragm up to the max. Do it gently for safety. Press your palms firmly to argument the compression. Strive to develop a sense of control of every inch of your movement, mindfully. 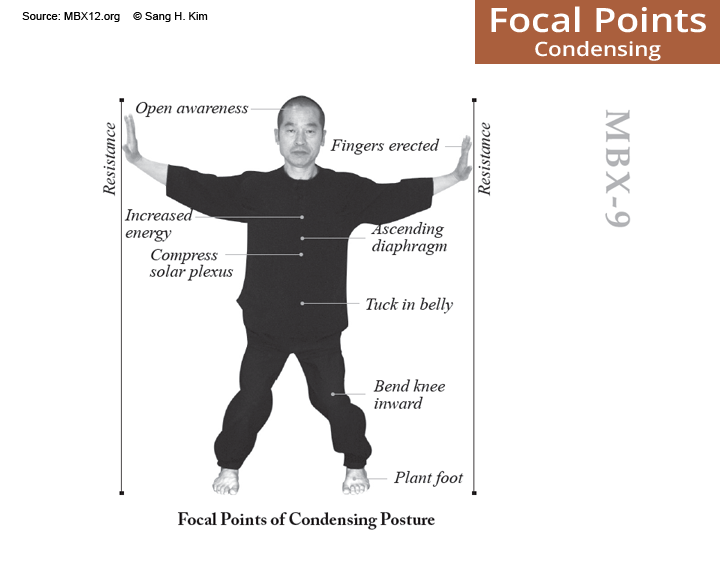 This entry was posted in MBX-12 Workshop, MBX12, Mindful Movement and tagged Centering, Composure, Condensing Posture, Equanimity, Equilibrium, How to Boost Energy, MBX-9, Sang H. Kim, Sense of Control. Bookmark the permalink.